A small town in Falkirk Council area, situated a half-mile (1 km) north of the River Carron between Larbert and Carron. Stenhousemuir developed on the estate of Stenhouse - the 17th century home of the Bruce family which was demolished in the 1960s. This had, in turn, taken its name from Arthur's O'on, a remarkable Roman rotunda which survived for 1600 years until it was taken down in 1743 by Sir Michael Bruce, who wished to use the stone to rebuild a dam on the Carron. In the 18th century, the village grew quickly through industry and agricultural markets. The Carron Iron Works was established nearby in 1759. Moving here from Falkirk in 1785, great cattle trysts took place on the common at Stenhousemuir - now a golf course - until the demise of cattle droving in the 19th Century. Droving brought Andrew McCowan (1874 - 1951) to Stenhousemuir in his youth, and it was here he established his confectionery business in 1924. Known for their Penny Dainty and Highland Toffee, Millar McCowan continues to manufacture toffee, fudge, chews and sweets in the town. A much-needed £15 million town-centre development opened in 2008, providing a new civic square, library, additional sport and leisure facilities, large supermarket and retailing outlets. 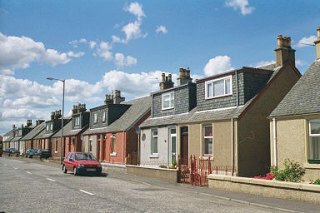 The town also benefits from a football ground (Ochilview Park) which is the home of Stenhousemuir Football Club, and recreational facilities in Crownest Park.